The Virtuoso JPEG 2000 Media Function provides visually lossless compressed transport of SD and HD signals with ultra low latency, using only 10% of the bandwidth required for uncompressed video. Nevion Virtuoso can run multiple instances of the JPEG 2000 Media Function on a single platform with built-in network aggregation to 10G Ethernet. 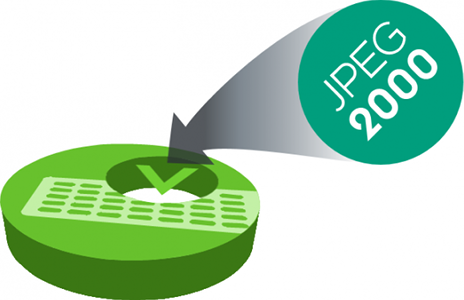 The JPEG 2000 Media Function requires the HBR Accelerator, which supports SD/HD/3G-SDI input, for encoding or decoding of up to four JPEG 2000 channels per Accelerator. The VSF TR-01 compliant TS over IP encapsulation ensures perfectly synchronized transport of video, audio and ancillary data, as well as interoperability with 3rd party equipment. The Nevion Virtuoso JPEG 2000 Media Function, combined with Nevion’s advanced protection mechanisms, enables broadcasters to utilize cost-efficient IP links for the real-time transport of professional media with low bandwidth utilization, combined with extremely high quality and availability.